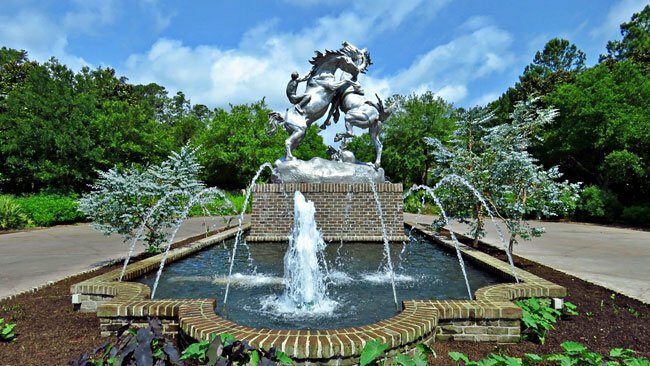 Brookgreen Gardens is one of South Carolina’s most beloved landmarks. 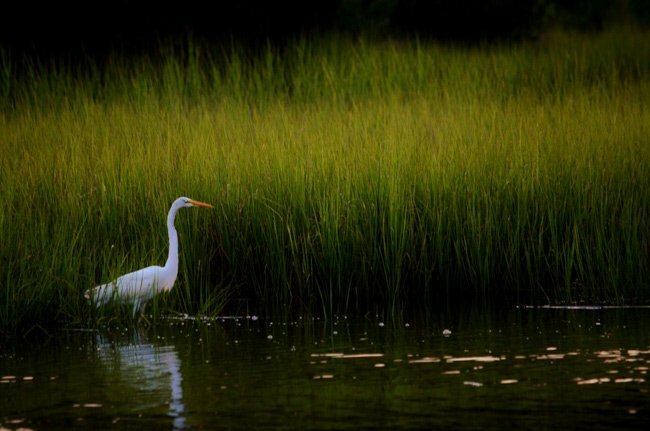 Located just south of Murrells Inlet in Georgetown County, this historic sculpture garden and wildlife preserve is a favorite destination for locals and visitors alike. 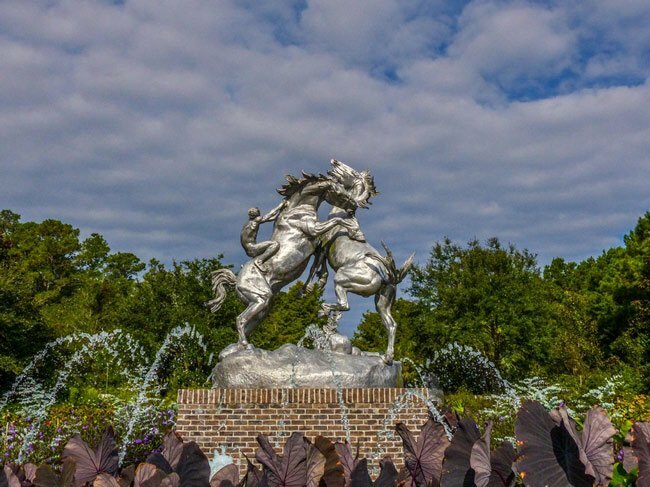 Anna Hyatt Huntington’s sculpture Fighting Stallions, seen below, greets visitors from the gardens’ entrance. 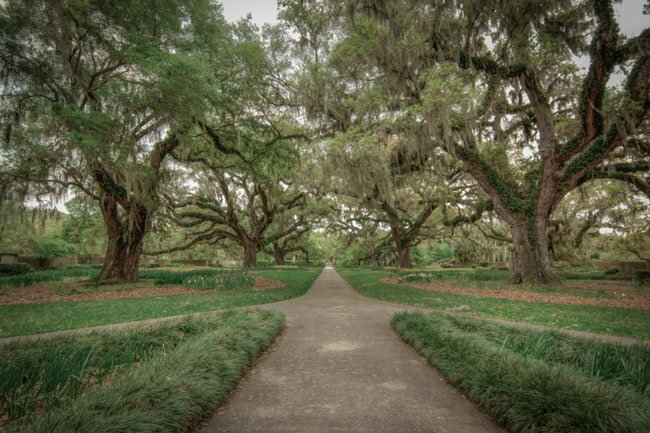 The land that comprises Brookgreen Gardens was originally inhabited by the Waccamaw Indians, but was developed into four separate rice plantations in the 1700s: Brookgreen Plantation, Laurel Hill Plantation, Oaks Plantation and Springfield Plantation. 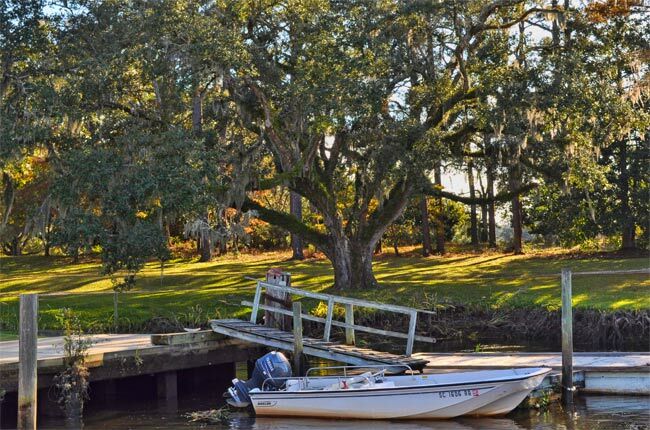 In 1930, New York philanthropists Archer and Anna Hyatt Huntington purchased over 9,000 acres of land (including the former plantations) stretching from the Waccamaw River to the Atlantic Ocean. This purchase included the beachfront property that would later become Huntington Beach State Park. 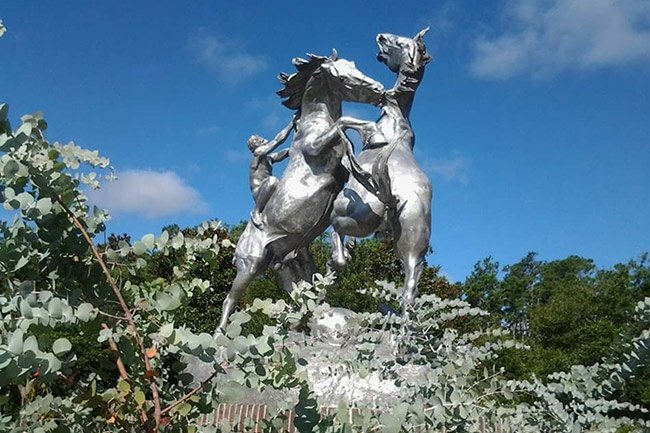 The beauty and history of the land prompted the Huntingtons to establish the first public sculpture garden in the United States. The Huntingtons wished to exhibit works of great American sculptors depicting a wide array of cultures and experiences. A well-regarded sculptor herself, Huntington belonged to the National Sculpture Society, the National Association of Women Artists, the American Academy of Arts and Letters, and the National Academy of Design. 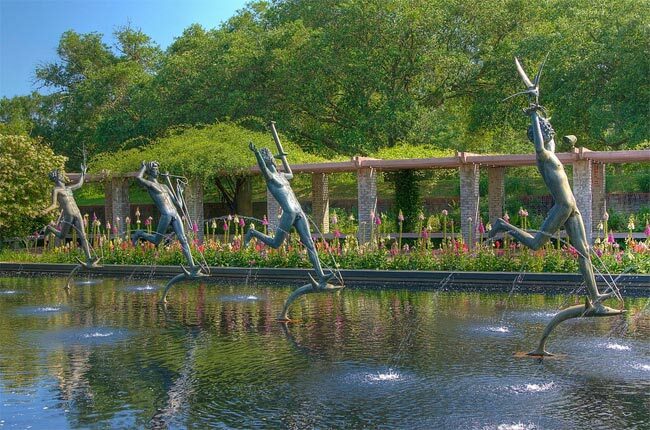 Today, the Archer and Anna Hyatt Huntington Sculpture Garden boasts a collection of more than 1,400 works from over 350 artists. Many of the works were created by co-founder Anna Hyatt Huntington. She is best known for her depictions of animals. The sculpture garden was declared a National Historic Landmark in 1992. Brookgreen’s 1931 charter established it as “A Society for Southeastern Flora and Fauna,” and adjacent to the sculpture garden is a zoo inhabited by animals indigenous to this area of South Carolina. 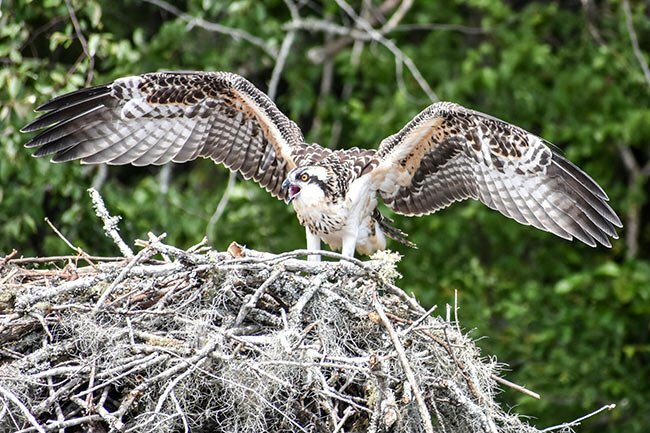 Visitors can observe native wildlife such as river otters and fox squirrels. In addition, one can also see domestic animals common to colonial South Carolina, including Red Devon Milking Cows and Tunis Sheep. The zoo also features several aviaries, a fox glade, a white-tailed deer savannah, and an alligator swamp. It is the only zoo on the coast of the Carolinas accredited by the Association of Zoos and Aquariums. The E. Craig Wall, Jr. Lowcountry Center backs up to the Waccamaw River and leads to the Lowcountry Trail. Visitors can stroll along the boardwalk and view Mainfield, a restored rice field that belonged to the former rice plantation. Boat excursions along the river are also available from March through November. 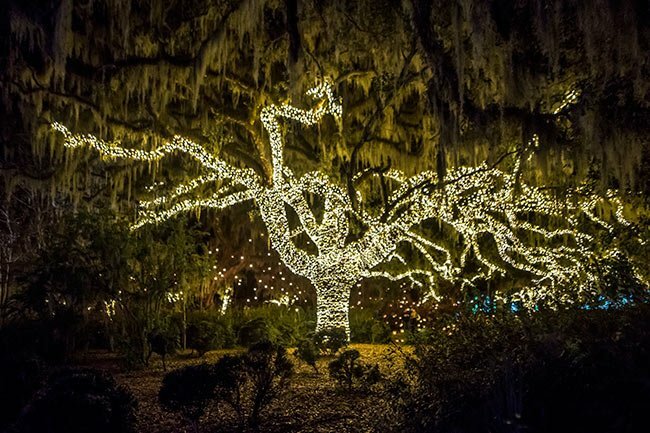 Each December the gardens open for a holiday event called Night of a Thousand Candles, a spectacular display of candles and lights viewed at every turn throughout the grounds. Though the zoo is closed for this event, the gardens stay open until 10:00 p.m. for this incredible exhibit. This statute entitled Diana of the Chase was created by Anna Hyatt Huntington. The goddess from Greek mythology stands on a globe, gazing upwards with a bow in her hand. 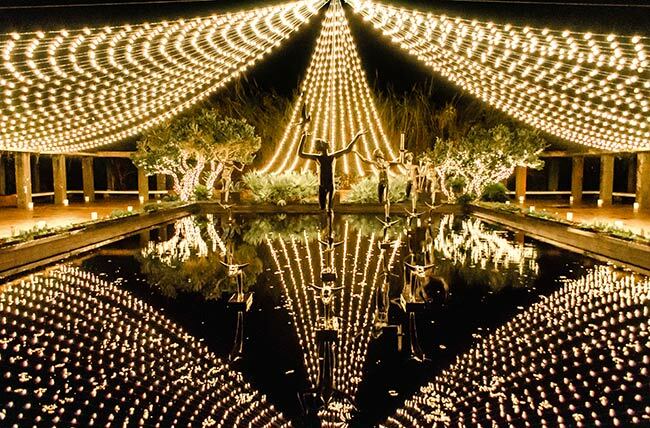 She is illuminated by the thousands of lights streaming from the Night of a Thousand Candles event. This live oak (quercus virginiana) is meticulously decorated for the popular event as well. 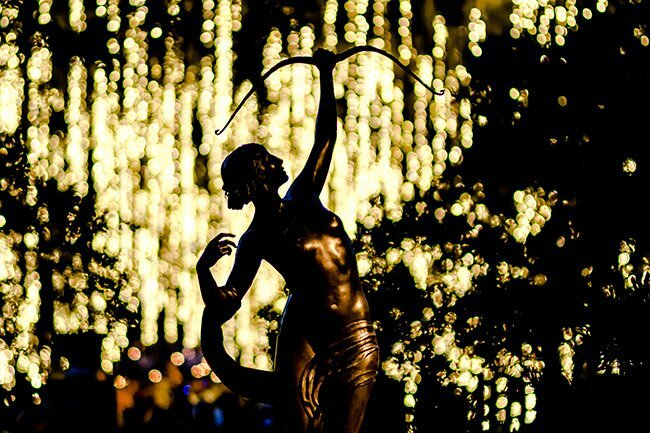 All ticket purchases go towards supporting Brookgreen Gardens, a nonprofit organization with the mission of promoting and displaying figurative sculpture by American artists and preserving regional plants, animals, and history. The statue seen below of a mother and child is known as Joy of Motherhood and was sculpted out of bronze by artist Willard Newman Hirsch. One of the themes seen most often in Hirsch’ work is the spiritual connection seen between mother and child. Hirsch was a gifted artist, and teacher, from Charleston. 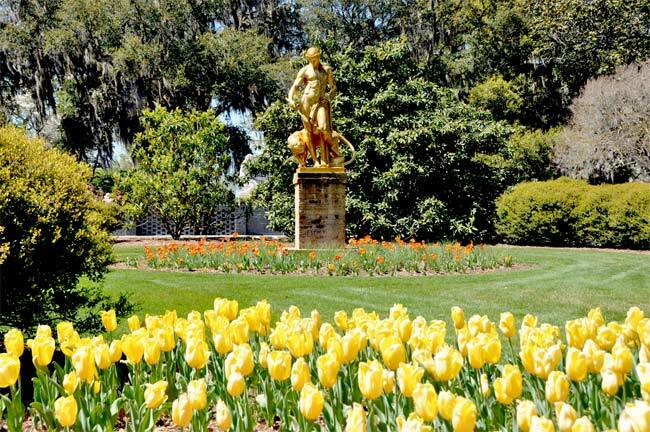 Brookgreen Gardens is known today as a botanical and sculpture garden. 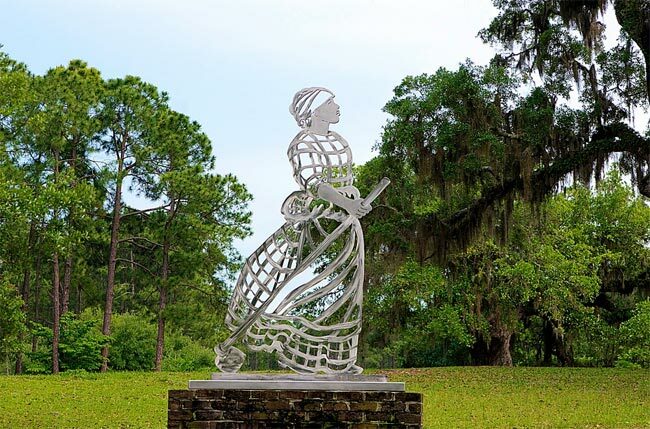 The nominated portion of the Gardens covers 1600 acres and includes three 18th and 19th century plantation sites, old plantation rice fields, and garden areas complete with sculpture. The property has significance in multiple areas, including art, archeology, agriculture, landscape architecture, military, politics/government, cemeteries, and social history. 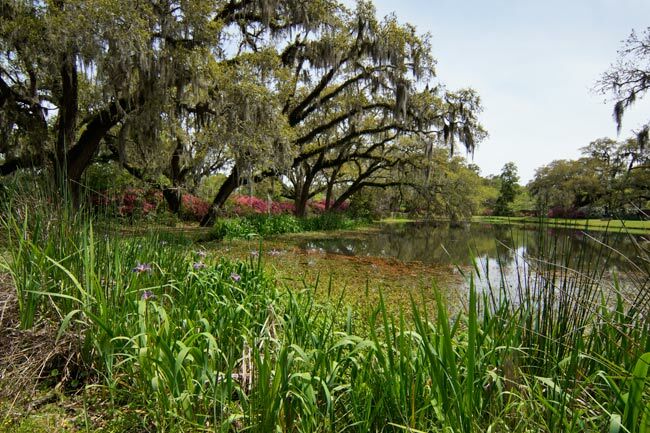 The Brookgreen Gardens property was part of an early rice plantation system that developed on the banks of the Waccamaw River in the 18th century. William Allston (1738-1781) developed the land into a plantation ca. 1760. He was the father of internationally noted artist Washington Allston, born here in 1779. Joseph Allston, Governor of South Carolina from 1812 to 1814 is buried here. Robert F.W. Allston, born here in 1801, was Governor of South Carolina from 1856 to 1858. Other persons associated with the plantations on the Brookgreen property include Joshua Ward, a noted agriculturist who developed long-grain rice, and Pulitzer Prize winning author Julia Peterkin. 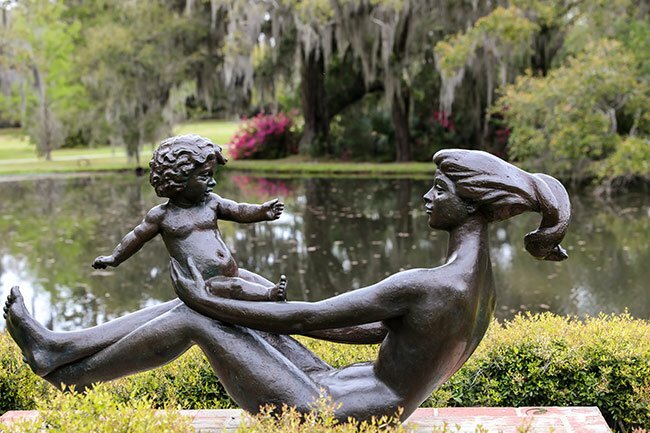 Brookgreen Garden’s founders, Archer Milton Huntington and Anna Hyatt Huntington, purchased the property in 1930 and developed it into a garden and sculpture museum. Anna Hyatt Huntington was a well-known sculptor, and some of her work is included in the gardens she designed. The site is considered to be the largest outdoor museum of sculpture in the United States. Absolutely stunning place to visit. My wife and I visited first about 2 years after we first married and this month again for at least the 30th time just after we celebrated our 53 wedding anniversary. Many additions and improvements to the grounds over the years. We enjoyed it as much after all these visits as we did the first time. 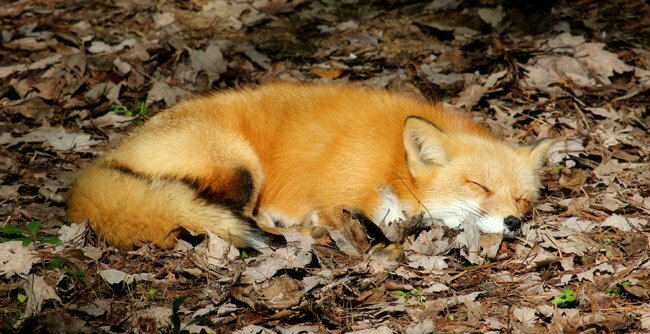 Spend the day –not a two hour run through. We always come after breakfast and eat lunch and leave as they are closing. I enjoyed my visit to Brookgreen Gardens today but was disappointed in the condition of many of the garden beds. Daylilies need to be deadheaded EVERY day; the blooms only last for a day. What I saw today were many dead flowers on plants, which took away from the beauty of the blooming ones. Additionally, there were lots of weeds throughout the garden beds. I realize that the gardens cover many acres; however, pristine flowerbed maintenance at a “garden sanctuary” is a must. I would suggest that volunteers from the Georgetown County Master Gardeners organization be recruited to help with maintenance. They would get “volunteer hours” necessary to maintain their MG certification, and it would help the regular workers to keep the place in tip-top shape. Possibly, you already do this, but a call-out for extra help would certainly be in order. As a Charleston County Master Gardener, I would advise better maintenance for a more pleasing representation of your lovely gardens. The restaurant is fabulous — enjoyed lunch there! Would love to see photos of the Lego sculptures. I was there but did not have a camera. One of the most impressive things ever! Went here years ago! They have added a few things over the years. I would love to go back with my digital camera! My old pictures are faded now. I visited when I was a little girl and then again as a young mother. I love the place and hope to return someday. But I had a picture of my two children sitting on a wall that had the most wonderful poem about entering a garden. I cannot locate the photo…is there anyone who could quote me the poem. It meant a lot to me as well as the picture. I wish I could find it…it was 34 years ago. I will keep researching. My Grandma and Grandpa Shoff brought me here when I was a very young boy. I can't wait to see this heavenly place again with my wife. It was the most beautiful place I have visited. Archer and Anna were truly visionaries. What a legacy they have left to the world for thousands of people to enjoy. 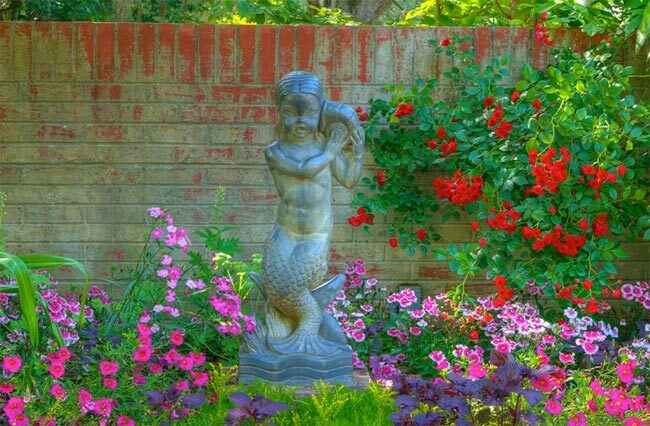 It would be a dream to live close to the BrookGreen Gardens. I will never forget the beauty of all the grounds. When my daughter-in-law and I were leaving, we saw a squirrel with a white face, head, and tail. I have never seen anything so beautiful! My visit was a retirement gift from my son and daughter-in-law — something I will never forget.